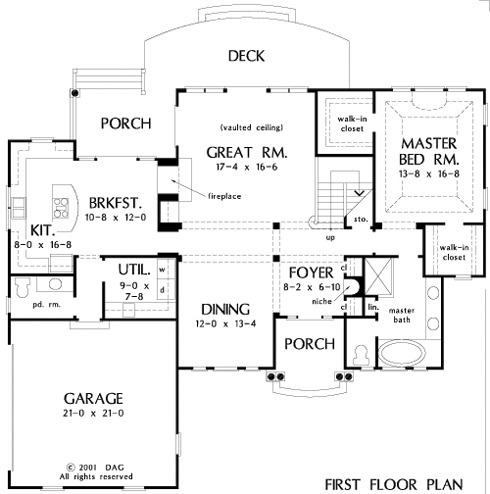 This house plan has plenty of modern features. A Palladian-styled window over the arched porch saturates the two-story foyer with light. The fireplace can be enjoyed from the great room or breakfast area, and French doors access the rear porch. The upstairs guest suite is complete with a private bath. 1st Floor: 1745 Sq. Ft. 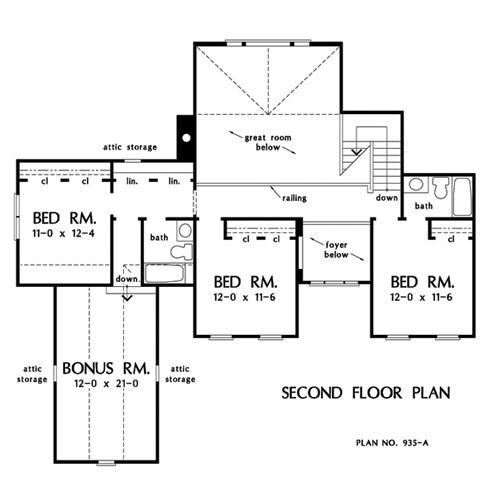 Bonus Room: 297 Sq. 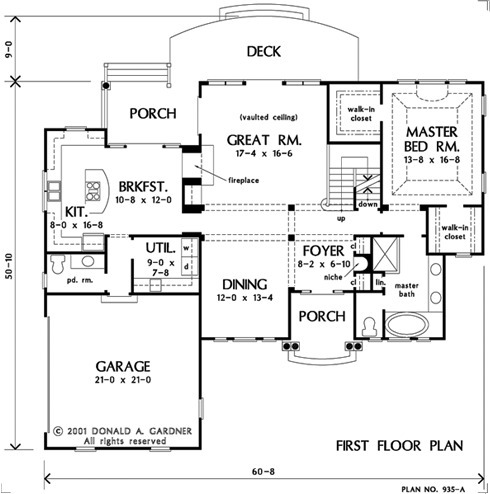 Ft.
House Dimensions: 60' 8" x 50' 10"
Great Room: 17' 4" x 16' 6"
Master Bedroom: 13' 8" x 16' 8"
Foyer : 8' 2" x 6' 10" x 9' 0"
Great Room (Vaulted): 17' 4" x 16' 6" x 18' 0"
Kitchen : 8' 0" x 16' 8" x 9' 0"
Breakfast Room : 10' 8" x 12' 0" x 9' 0"
Utility Room : 9' 0" x 7' 8" x 9' 0"
Bonus Room (Vaulted): 12' 0" x 21' 0" x 9' 5"
Master Bedroom (Tray): 13' 8" x 16' 8" x 11' 2"
Bedroom #2 : 11' 0" x 12' 4" x 8' 0"
Bedroom #4 : 12' 0" x 11' 6" x 8' 0"
Porch - Front : 8' 8" x 8' 1" x 0' 0"
Porch - Rear : 13' 6" x 6' 6" x 0' 0"
Deck / Patio : 26' 0" x 9' 0" x 0' 0"
Balcony : 24' 8" x 4' 2" x 8' 0"